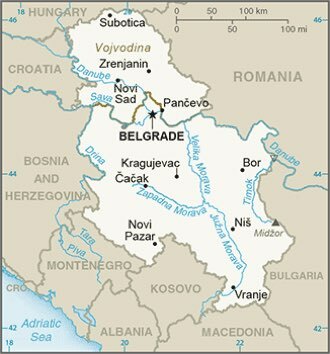 Serbia : When and where to go? The climate is continental temperate. Serbia experiences cold winters, even more severe in the mountains, with temperatures as low as -15 ° C, and hot, sunny summers. It is between May and September that you will find the best conditions to visit the country. Belgrade, the capital, is dominated by the fortress of Kalemegdan, which was the object of recurrent battles for the Romans, the Celts, the Turks, and the Slavs. In the old town you will find a large and long pedestrian avenue, lined with cafe terraces and beautiful facades, then a large esplanade where the National Museum and the Skadarska Street, where Gypsy musicians and street painters meet. Also worth seeing is the St. Sava Cathedral with its golden dome, Princess Ljubica's palace, the banks of the Danube and the pastel houses of the Zemum suburb. Novi Sad, in the autonomous province of Vojvodina, is also a lively and cheerful city, offering visitors parks, open-air cafes or alleyways, a lively pedestrian street and Renowned music festival as part of its Petrovaradin Citadel every year in July. There is also a regional museum where you can admire local costumes and crafts and a host of churches. The valley of the Danube unfolds its landscapes punctuated with citadels and castles: Smederevo citadel, Golubac fortress of the 14th century on its rocky peak with battlements and dungeons, but also impressive natural sites like the Gates of Iron Gates, the canyon of Kazan and its cliffs 300 meters high, and the national park of Djerdap whose forests conceal wolves, bears and lynx. One can not speak of Serbia without mentioning the monasteries, 5 of which are classified by UNESCO: Decani, Djurdjevi Stupovi, Sopocani, Stari Ras and Studenica. But these treasures are much more numerous, and each of these monasteries have their peculiarities, walls of white marble, frescoes, domes, according to the period of their construction and their style of architecture. Let us not forget the national parks: the two most important ones are located in Sandjak, in the south of the country. Tara, to the west, is home to mild mountains interspersed with canyons dug by torrents, where one can hike, and discover the beautiful village of Sirogojno. Close to Kosovo, Kopaonik Park is home to the country's highest peak, Mount Pancic (2016 m) and a ski resort. A visa is not required for EU nationals. The current currency is the dinar (DIN) but you can use the euro. By plane, you will land at the Nikola-Tesla Airport in Belgrade. You can also reach Serbia by bus or train. To travel within the country, a bus network exists, but beware of connections that are not always very convenient. There are also trains but they are infrequent. The easiest way is to rent a car if you can afford it. Budget: count for an average level of service about € 10 for a meal and less than € 50 for your accommodation, but you can eat for € 5 and find hotel rooms at € 15 if you are not demanding . Health: Except in large cities, prefer bottled water to that of the tap. Do not bathe in stagnant water. Security: Avoid border areas with Kosovo, especially because of the mines that may remain there, but also because of the ethnic tensions that still make the region unstable. Be vigilant if you drive because of the poor quality of the roads and the carelessness of the drivers. Shopping: Local crafts produce many items of interest. You can bring wooden icons, embroidered tablecloths, coffee grinders, kilims, or knits created by the women of the Sirogojno cooperative.